The adventures of a vintage Airstream trailer and its artist owners. 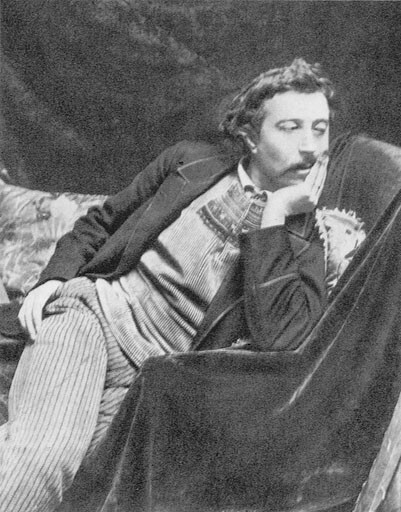 Eugène Henri Paul Gauguin was born June 7, 1848 and lived until May 8, 1903. Paul Gauguin was a French Post-Impressionist artist. He was an important figure in the Symbolist movement as a painter, sculptor, print-maker, ceramist, and writer. His bold experimentation with color led directly to the Synthetist style of modern art, while his expression of the inherent meaning of the subjects in his paintings paved the way to Primitivism. His mother was from an influential Peruvian family. In 1850 his family left Paris for Peru but his father died on the voyage, leaving 18-month-old Paul, his mother, and sister, to fend for themselves. They lived for four years in Lima with Paul's uncle and his family. The imagery of Peru would later influence Gauguin in his art. In 1873, around the same time as he became a stockbroker, Gauguin began painting in his free time. That same year he married a Danish woman, Mette-Sophie Gad. They had five children. After the stock market crashed in 1882 and the art market contracted, Paul Durand-Ruel, the Impressionists' primary art dealer, for a period of time, stopped buying pictures from painters such as Gauguin. Gauguin's earnings contracted sharply. 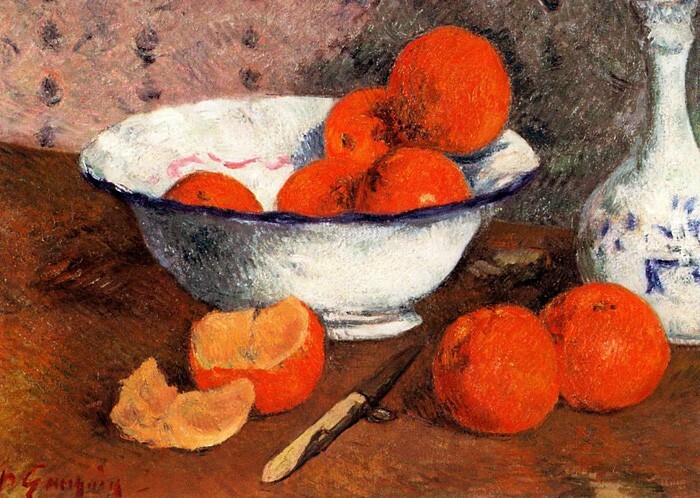 The following two summers he painted with Pissarro and occasionally Paul Cézanne. 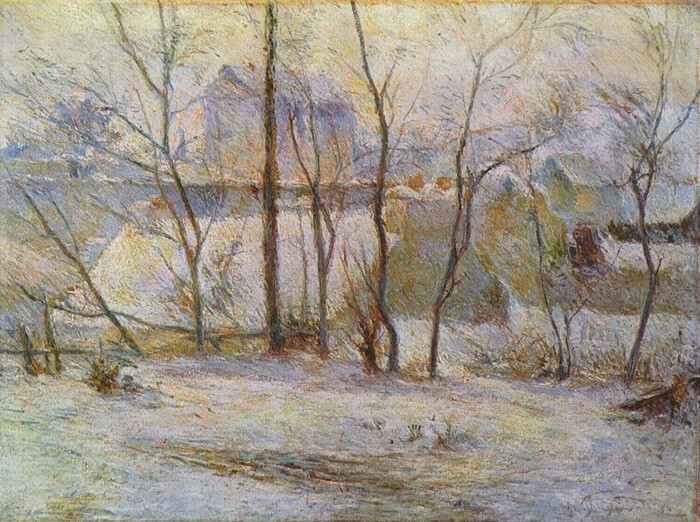 In October 1883, he wrote to Pissarro saying that he had decided to make his living from painting at all cost. 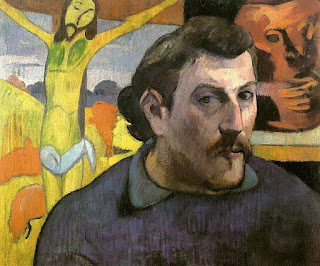 His middle-class family and marriage fell apart after 11 years when Gauguin was driven to paint full-time. After a period of time living in Copenhagen, he returned to Paris without his family. His Parisian life centred on the 9th arrondissement of Paris. All around were the cafés frequented by the Impressionists. He formed a friendship with Pissarro and visited him on Sundays to paint in his garden. 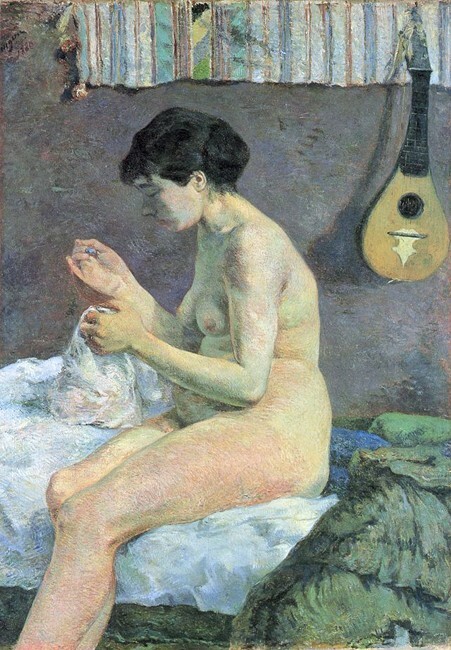 Pissarro introduced him to many other artists. Gauguin showed paintings for the first time in Impressionist exhibitions held in 1881 and 1882. His paintings received dismissive reviews. Under the influence of folk art and Japanese prints, Gauguin's work evolved towards Cloisonnism, a style given its name by the critic Édouard Dujardin in response to Émile Bernard's method of painting with flat areas of color and bold outlines, which reminded Dujardin of the Medieval cloisonné enameling technique. 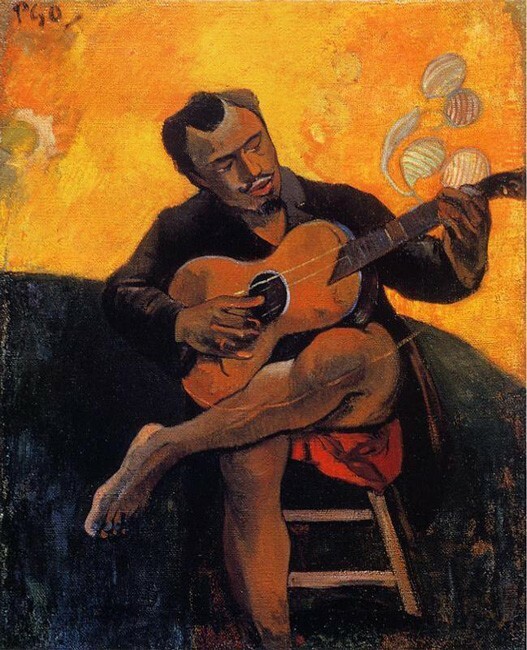 Gauguin was very appreciative of Bernard's art and of his daring with the employment of a style which suited Gauguin in his quest to express the essence of the objects in his art. 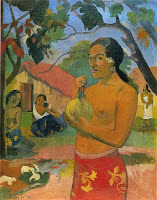 In 1887, after visiting Panama, Gauguin spent several months near Saint Pierre in Martinique, Gauguin's Martinique paintings were exhibited at his color merchant Arsène Poitier's gallery. There they were seen and admired by Vincent van Gogh and his art dealer brother Theo van Gogh, whose firm Goupil & Cie had dealings with Portier. 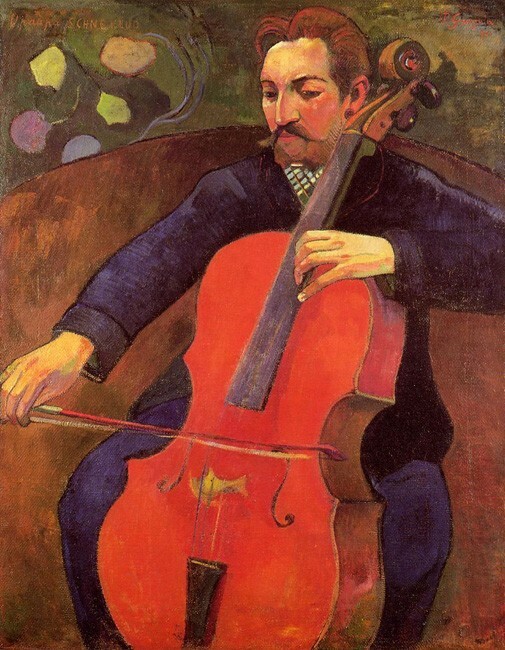 Theo purchased three of Gauguin's paintings for 900 francs and arranged to have them hung at Goupil's, thus introducing Gauguin to wealthy clients. At the same time Vincent and Gauguin became close friends (on van Gogh's part it amounted to something akin to adulation) and they corresponded with each other on art, a correspondence that was instrumental in Gauguin formulating his philosophy of art. The arrangement with Goupil's continued past Theo's death in January 1891. Gauguin's relationship with Vincent proved fraught. In 1888, at Theo's instigation, Gauguin and Vincent spent nine weeks painting together at Vincent's Yellow House in Arles. Their relationship deteriorated and eventually Gauguin decided to leave. On the evening of 23 December 1888, according to a much later account of Gauguin's, van Gogh confronted Gauguin with a razor blade. Later the same evening, van Gogh cut off all or part of his left ear. He wrapped the severed tissue in newspaper and handed it to a prostitute named Rachel, asking her to "keep this object carefully." Van Gogh was hospitalized the following day and Gauguin left Arles. By 1890 Gauguin had conceived the project of making Tahiti his next artistic destination. Many of his finest paintings date from this period. In August 1893, Gauguin returned to France where he continued to execute paintings on Tahitian subjects. By this time it had become clear that he and his wife Mette were irrevocably separated. 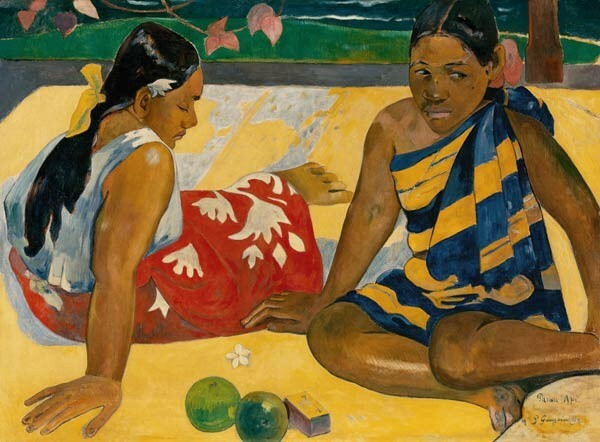 Gauguin set out for Tahiti again on June 28, 1895, disillusioned with the Paris art scene. 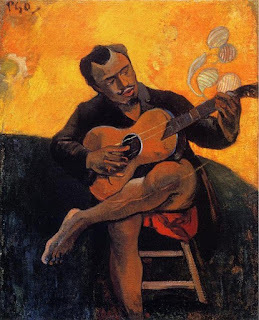 He arrived in September 1895 and was to spend the next six years living, for the most part, an apparently comfortable life as an artist-colon. During this time he was able to support himself with an increasingly steady stream of sales and the support of friends and well-wishers. He built a spacious reed and thatch house at Punaauia in an affluent area ten miles east of Papeete in which he installed a large studio, sparing no expense. His health then took a decided turn for the worse and he was hospitalised several times for a variety of ailments. While he was in France, he had his ankle shattered in a drunken brawl on a seaside visit to Concarneau. The injury, an open fracture, never healed properly. Now painful and debilitating sores that restricted his movement were erupting up and down his legs. These were treated with arsenic. 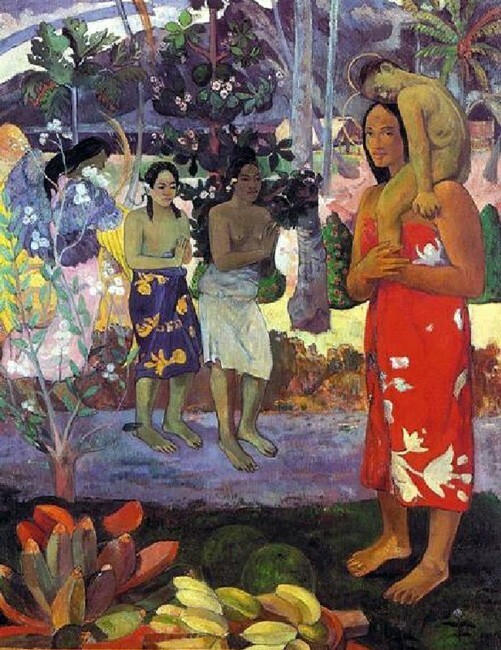 Gauguin blamed the tropical climate and described the sores as "eczema", but his biographers agree this must have been the progress of syphilis. He died suddenly on the morning of May 8, 1903. Earlier he had sent for his pastor Paul Vernier, complaining of fainting fits. They had chatted together and Vernier had left, believing him in a stable condition. However Gauguin's neighbour Tioka found him dead at 11 o'clock, confirming the fact in the traditional Marquesan way by chewing his head in an attempt to revive him. By his bedside was an empty bottle of laudanum, which has given rise to speculation that he was the victim of an overdose. Vernier believed he died of a heart attack. On the road somewhere in North America. Two artists, two visions, one ArtStream journey. Thanks for stopping by. We have created this blog to share our adventures in a 1955 Airstream. We are on a journey of making art and seeking other creative spirits along the way.